Our favorite time of year at the Inn is Fall. Not only are the leaves changing colors but the cooler temperatures bring out some of our favorite recipes. One of those fall favorites is our Apple Cider Scones. The best part is they are made with apples and cider from a local cidery – Distillery Lane Ciderworks in Burkittsville. Place 1/2 tsp vanilla in measuring cup. Add 6 TBs of apple cider and enough buttermilk to equal 1/2 C. Keep chilled until ready for use. Pour contents of bag into mixing bowl. Add 1/2 tsp of cinnamon. Cut in 6T chilled butter until mixture is fine and crumbly. Add raisins or dried apples (diced) to mixture and stir to distribute. Pat out the ball of dough into a flattened circle, 6-7” in diameter, approximately 3/4- 1” thick. Using a sharp knife, cut circle into eighths. At this point you may freeze the dough to be used later. Place scones on parchment lined cookie sheet. Bake in preheated oven at 425 degrees for 13-18 minutes (time will vary with scone size). Top should be light golden brown when done. As the scones are baking prepare your cinnamon butter. Combined 1/2 C butter, 1/2C powdered sugar. Then add 1 tsp cinnamon. Add more powdered sugar if needed to taste. Chill in refrigerator. 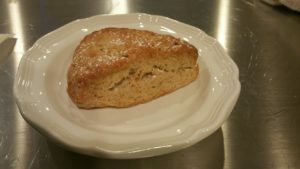 Lightly powder scones and serve warm with a to small scoop of cinnamon butter. – Place cut scones on parchment/wax paper and freeze, then store in a plastic bag in the freezer. This allows you to remove and bake only what you need.